Bellaire Chamber of Commerce announces the 36th Annual Holiday Gift Fair. As the holiday season arrives, the list of loved ones in need of gifts grows and ideas can sometimes go flat. Be original and trendy this year and pledge to buy local and handmade. Why buy handmade this season? When you buy handmade you can be sure that your gift is made with love. You are supporting local artisans, and their local economy and community. Your gifts are unique making everyone ask "Where can I get one?" 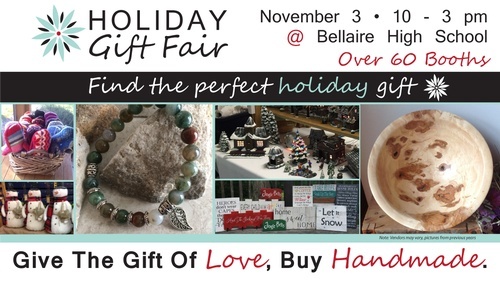 Find the perfect "Handmade" gift for your love ones at the 36th Annual Holiday Gift Fair at the Bellaire High School on November 3rd from 10 am – 3 pm. Featuring over 60 regional artisans, with everything from jewelry and soaps to local maple syrup and custom furniture, you are sure to find the perfect holiday gift for everyone on your list. Since its inception in 1982, the Holiday Gift Fair has been a highly anticipated shopping event and kicks off the holiday shopping season. Antrim County residents look forward to finding a unique gift for a friend's birthday, their family Thanksgiving and more. Bellaire Chamber of Commerce will be holding raffles every ½ hour throughout the day with great prizes from our artisans. A fun day of shopping, this inside event is a great way to support our local economy. The event will be from 10-3 pm at the Bellaire High School, enter through the East parking lots on Victory Lane. For more information or to register for a booth, contact Patti or Rachel at the Bellaire Chamber of Commerce at 231-533-6023 or www.bellairechamber.org.